L'Iris de Fath is a new perfume by Jacques Fath for women and men and was released in 2018. The scent is woody. The longevity is above-average. It is being marketed by Panouge. 150 pieces are to be made annually. I was able to test L'Iris de Fath on paper and on skin during the 2018 Esxence show. I haven't had the opportunity to smell vintage original Iris Gris, nor the reconstructed version of Osmothèque. So I can only assess this fragrance on its own merit. On paper, the majestic orris root immediately took my breath away: the almost buttery milkiness, the violet-tinted woody backbone, the slightly carrot-like rooty undertone, all the fascinating features of iris raw materials are here, satisfyingly rich without feeling weighed down by itself. The peach was initially quite shy, like the first sunshine at dawn barely through the substantial cloud of iris. When much later on, the dried peach-like, decadent and mature fruitiness finally gains the upper hand, the lactonic aspect of the peach makes a natural transition to the creamy iris. An intriguing bitterness also hides within, recalling both the peach pit and the rootiness of iris. Whereas it's already fairly enchanting on paper, L'Iris de Fath really blooms on the skin. While the exquisite orris still leads the way during the opening, the peach comes through much earlier with its succlulent fruity sweet-tartness. This immediately creates a contrast between the plush, almost unctuous orris and the lively, glowing peach, and renders the fragrance a somewhat 3D effect compared to its performance on paper. Then, at around 30 minute mark, something unexpected (to me) happens: a vivid oakmoss starts to spread underneath the peach-iris and eventually becomes an equal player starting from the 1 hour mark. At this point, it actually smells to me like a technicolor Mitsouko with a big dollop of luxurious orris! I say technicolor, because the 90s EDT, 2014 EDP and 2015/2016 EDT versions of Mitsouko all smell more or less sepia to me, with the dried peach barely illuminates the dry, slightly leathery and faintly mossy base like candlelight reflecting on a sepia-toned vintage photo. But in L'Iris de Fath, the peach is more exuberant and luscious, while the oakmoss is greener and more lush, as if the saturation parametre is dialed up in this picture. A soft veil of powdery spicy carnation gently hovers upon the mossy base, like a distant echo of 1940s when this flower was in its prime in perfumery. The moss retreats to the background about 4 hours in. It now essentially provides a velvety, plush texture to the tender duo of peach and orris. L'Iris de Fath then remains this silken, cozy yet elegant skin scent of peach and iris till the end. The sillage is mostly close to my skin, while the total longevity is around 8 hours. Personally speaking, I'm very fond of L'Iris de Fath. The bright, colourful peach and the sumptuously buttery orris make an enticing contrast yet are still harmoniously, seamlessly blended together. The coral glow of peach shines upon the thick, almost grey cloud of orris, yet when the peachy light and the orris cloud expand towards the horizon, the edge is blurred into gorgeous sunset afterglow. Numerous references from vintage perfumes can be picked out in L'Iris de Fath, from the peach-mossy Mitsouko association, the powdery kiss of carnation to the overall elegant and abstract style of classic perfumery. However, the fragrance itself ultimately feels contemporary, even timeless, partly because latest releases seem to favour buttery orris than metallic, rooty or starchy types of iris, partly thanks to it using modern raw materials, but most importantly, I think it retains the kind of harmonious beauty with a broad appeal that has the potential to transcend time. When compared to other iris or iris-peach fragrances, I also find L'Iris de Fath quite unique. Iris Silver Mist exaggerates the rooty, carrot-like aspect (which I dig), while Xerjoff Irisss skews a bit powdery violet lipstick-like after its initial creamy opening, but L'Iris de Fath really puts forward the buttery texture of iris without forgetting its woody and rooty undertone. When set side by side with Sultan Pasha Irisoir and DSH Scent of Hope, the biggest difference that I perceive is the mossy base and the subtle carnation touch in L'Iris de Fath. Regarding the peach-iris duo itself, I find that Scent of Hope has a more dominant peach and Irisoir has more emphasis on the woody iris (I enjoy both too), whereas L'Iris de Fath has a more balanced peach-iris and is more buttery in comparison. 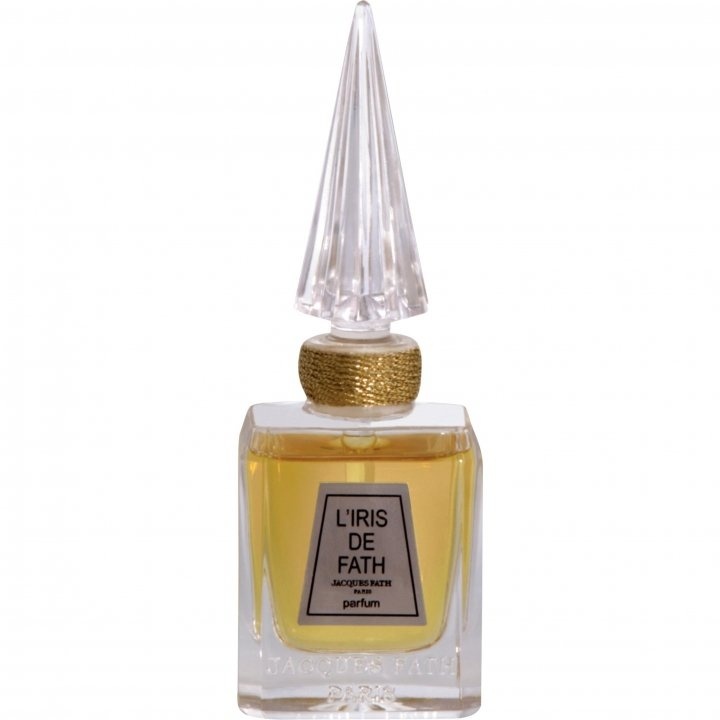 However, as much as I enjoy L'Iris de Fath, I have to admit that its 1470 euros/30 ml price is indeed a very steep one. Reading the interview conducted by Fragrantica, it seems to me that its pricing and limited distribution are at least partly a deliberate choice to keep it rare. While I certainly would like that it fit into my range of budget, based on what I smelt, it has a certain level of quality and artistry that I personally don't feel shocked if people are willing to pay for it. After all, it's a purely subjective issue depending on one's taste, value and personal circumstances. That being said, with 150 bottles produced per year and at this price, to sample it would probably require much effort and money, and along with it, an extremely high expectation which will be very difficult to live up to, like any legendary unicorn in perfumery. However, if you're prepared on this front, I personally would definitely recommend giving L'Iris de Fath a try, especially if you happen to be around the boutique where it will be available. Write the first Review for L'Iris de Fath!